View More In Bath Rugs. Place this soft microfiber bath mat outside of your bathtub or shower to provide a soft, water-absorbent solution, or in front of your vanity to keep bare feet warm and comfortable. Accent your bathroom décor with a subtle, modern high-low border design, the bath mat has a non-slip backing to keep your rug securely in place, preventing slips and sliding in wet areas. Made from 100% microfiber polyester, the rug is super absorbent and dries quicker than cotton rugs. Soft and cushioned underfoot after a long shower or bath, the comfortable mat adds a touch of spa-like luxury to your bathroom and keeps your toes off the cold, hard floor. Low maintenance, the bathroom mat is machine washable and quick drying for easy laundering. InterDesign’s creative products enhance your décor, turning simple home solutions into must-have elegant accessories that shine. Designed in the USA, we are proud to produce a wide selection of high quality home, bath and storage solutions that excite, inspire and charm. Stylish, functional and affordable, our products have been enriching customers’ homes for over 40 years. InterDesign: innovative products, exceptional value. SOFT & LUXURIOUS: Plush, super-soft 100% microfiber polyester bathroom rug for maximum comfort. STYLISH ACCENT: Add a splash of color with the attractive, solid water rug - measures 34" x 21". 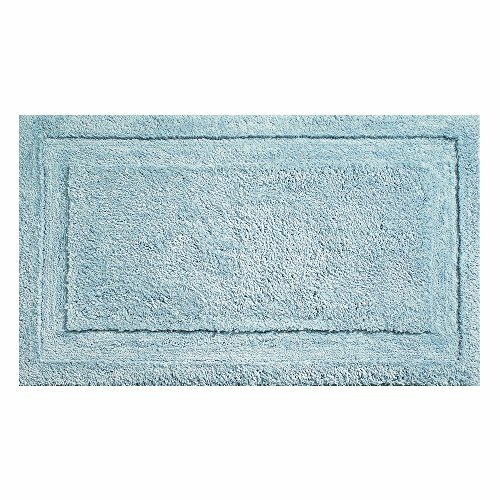 NON-SLIP DESIGN: The practical, absorbent bathroom rug and has a skid resistant backing for safety. EASY CARE: Machine washable, the low maintenance rug also dries fast - quick and easy laundering. THE INTERDESIGN PROMISE: Bringing you elegant, affordable home products for over 40 years. If you have any questions about this product by InterDesign, contact us by completing and submitting the form below. If you are looking for a specif part number, please include it with your message. Bare Decor Fuji String Spa Shower Mat in Solid Teak Wood Oiled Finish. XL Square 30" x 30"